Couldn’t sleep last night. Perhaps it’s my meditation practice — my mind is fighting back against my attempts to quiet it. At any rate I finally gave up, got up, and sketched what was going through my mind. This is it. I think it’s self-explanatory. In 2008 I was, I think, in camp F, because I believed in the power of the people, unchained. In 2009 I was, I think, in camp G, because I’d begun to believe collapse was already too far along. In 2010 I was, I think, in camp H, because I’d given up hope, but still wanted to do something. In 2011 I was, I think, in camp I, because I realized the Jevons Paradox effect will negate the effects of any activism, and because I was afraid of being hurt or imprisoned as an activist. In 2012 I was, I think, in camp J, because I realize that people will start to build real communities only when they have no other choice. The late great Joe Bageant rightly said: Community is born of necessity. But I haven’t abandoned camp F, because I really want to believe, and really admire Charles Eisenstein, and because fellow phenomenologist David Abram is there. And I haven’t abandoned camp G, because I really like Transition’s pragmatism, and really admire Rob Hopkins. And I haven’t abandoned camp H, because my instincts tell me we have to fight, and because I really admire Derrick Jensen. And I haven’t abandoned camp I, because we’ll have to do this work eventually, and because I’m always trying to get ahead of the game. But as long as the media and many/most of the people I know are still in camp A, this map gives me some comfort that I’m not crazy, and some sense of where I’ve come from. Hope you find it useful, or at least fun. As far as I can tell, everyone one of these camps is predicated upon resistance (a derivative of fear) — ie based on the premise that life at present is f****d-up and therefore we need to side step, fix up, ignore and plan ahead, salvage what we can, withdraw from (placate our troubled mind through meditation / pet distraction / opiate-of-choice), or otherwise escape, the present situation. The world is worn and tired, there can no doubt about that. But I think it is helpful to distinguish between the world (the phenomenological universe and aspect of our experience) and Life itself… otherwise we humanoids tended to think of the world as all there is, and become despondent and paralysed by that thought. We can do all sorts of stupid things and create all manor of destruction, but Life can still be good… and work for us, the moment we elect to align our lives with its ways. So here’s a thought: What if we are not here to change life-as-it-is, but-life-as-it is here to help us change instead. And that it is through embracing, as opposed to resisting, the fullness of our experience (no matter how climatic these appearances), that we actually get the opportunity to see, experience and transcend the repressed fears and self-delusions that holds us back from being who we truly are — ie the way to come home to our resourceful and fearless Self, that will naturally creates a future quite unlike the past. Thanks Nick. I guess the chart really isn’t self-explanatory. “Camp” J (Existential) is supposed to be just about exactly what you are describing as an appropriate response. I agree that the others are built on fear (and I am trying not to pass judgement on that, since I think it’s perfectly understandable). I’m also trying to avoid trying to suggest a “progressive path” to these, which is why I wrote the blurb after the chart. I think you can be in two places at once, at least politically and philosophically, and I think there are multiple pathways from any “camp”, many of which a lot of people I know have taken or are likely to take in future. Including some backtracking. So the point is to try to capture what is (particularly among those who are past denial) rather than what could be or what should be. It’s just a back-of-the-napkin map of the territory, with all the limitations thereof. I think I’m in Camp J, learning to accept the impending collapse of civilization. I don’t know what to work towards (I’m not in I, H, or G), but I hope to learn who we truly are (as Nick suggests); I hope to uncover my self-delusions. This blog aids me in that exploration. Thanks! I’ve just posted this on Generation Alpha (www.facebook.com/GenerationAlpha) which has already started some interesting debate you may find interesting. Hi Dave…… I just love your blog! Keep it up mate, we need more people like us! Hi Dave, I like your map. Cold you please explain the term ‘integrals/reprogrammers’ in more detail? Can you give some examples of groups/individuals that fit this category? I confess I am not terribly familiar with the philosophic or political views of those I’m calling integrals/reprogrammers, but I do know quite a few people, e.g. adherents of Wilber, spiral dynamics, NLP, some martial arts etc. who seem to believe that working hard at specific programs of self-improvement is the key to personal salvation, and that those who are especially good at this are likely to transcend normal human limitations and hence become leaders of choice when the SHTF. I am not saying these groups all believe the same thing, nor am I passing judgement on them, just saying that to me they seem to fit a pattern, a cluster, discernably different from the other ‘camps’ on this chart. Dave – thanks once again for applying your clear thinking to this hazy territory. One suggestion – the vertical axis gives a critical dimension to the map, and I think it’s not sufficiently prominent. FYI, I work full time in G (in Transition Network). Alongside that, I have strong affinity with F, J and H. My shadow impulses push me towards I.
I’ve been trying to map out something similar for months now and my waste bin is full. This is great. Good map. But in all fairness it misses an “L” (or something – “We’re all gonna die”. There are actually some of those around. Or do you figure they go into “J”? OK Nick — very funny. I take your point (that it’s probably impossible to be agnostic in drawing a map like this). But Kim’s point is actually ambiguous. For some “We’re all gonna die” is an exclamation of horror, panic. For others it’s a statement of resignation. In either case its claimants might belong in any of several camps on this chart (perhaps in several at the same time), depending on the ‘meaning’ they ascribe to the statement. For the same reason, I considered but decided against including a ‘camp’ for ‘anarchists’ because they are “all over the map” so adding them doesn’t improve the utility (if there is one beyond its entertainment value) of the map. Perhaps tonight’s insomnia will produce something better. Nice – this really brings a dose of clarity to the situation. I’m constantly reassessing where I am with relation to the idea that the human ecosystem is just past the peak of the exploitation phase and heading into the release phase of our adaptive cycle. As I gradually take more of a systems view of the situation, and less of an humanistic view, I find myself becoming more firmly embedded in the existentialist/Dark Mountaineer camp. It is what it is. I have a growing sense that what we are facing is a problem inherent to the evolution of complex adaptive systems, and that all the human discomfort associated with it is a symptom rather than a cause. It’s an interesting view, because it takes virtually all the emotional drama off center stage. There are still no “solutions”, but at least it’s easier to get a clear view of the problem. Let’s hear it for existentialist insomnia! Love it Dave, both fun and clarifying! And if Paul Chefurka’s a fan, that’s always a promising sign! As you say in comments, I think “we’re all gonna die” is more of a statement of fact that can be meant/interpreted in numerous ways (just like “this civilisation’s got a few problems”) and it is the response to it that determines which camp you’re in. For example, my recent post on that very topic was (I believe) very much in ‘Camp J’. Unsurprisingly, that seems to be popular territory amongst your readers, judging by the comments above! I’m now pondering how the tag “doomers” attaches to these different camps – which camps think of which other camps as “doomers”, whether in terms of outlook, or in terms of the likely outcome of their outlook (the future we expect is not the same as the future our expectations produce). 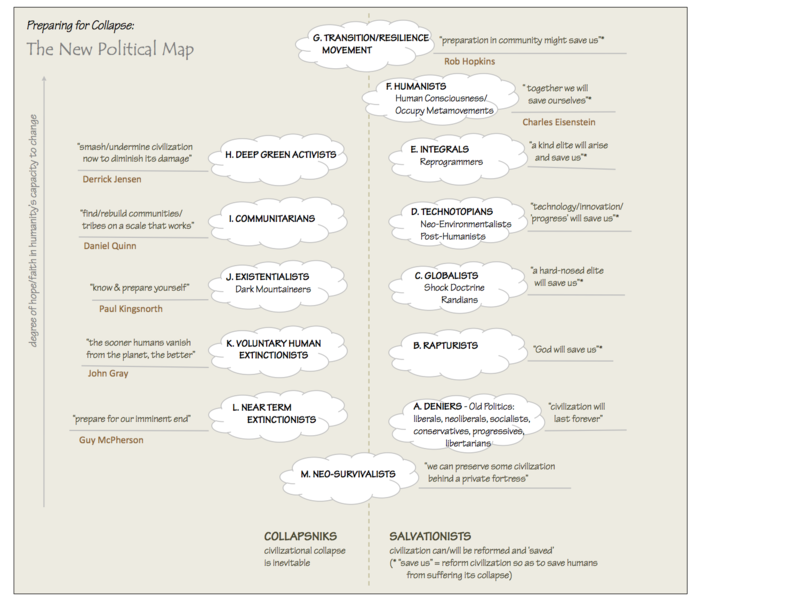 I guess I would fall into the technotopian bucket. But hey, it’s the rage this day and age to believe that cradle-grave economics and filthy energy technology that got us into this ‘pickle’ is the end game and “powering down” is somehow the right course of action. Does this simply play to mankind’s cherished subroutines, namely religion and politics? Or can today’s technology be re-scripted and replumbed before it kills the human experience: rebooted for the journey ahead? Yes it can, and in fact it must be. Where does this grand replumb begin? In the individual mind and heart, focused like a laser and shining like the Sun on what’s in the average trash can. Alchemy awaits the building of a carbon-bridging pollution solution so mankind can cross over. Developers (builders) wanted. Please read the note on our FB page titled, “Higher Mixed Alcohol Fuel: What on Earth is it?” thanks. Well done, Dave–a useful model. For more than 40 years Stanford Research Institute has created similar models (VALS–Values & Lifestyles) that have been used strategically by corporate marketers to target specific segments of the population. As you’ve identified, each category comes with a different mindset, which has its origin in core values. I notice some interesting parallels between the models, and the implications are worthy of further study because as Bodhi Paul writes, “There are still no ‘solutions’….” and he has correctly identified the problem as inherent to the evolution of complex adaptive systems. My concern is the huge number of people in categories A-C, whose values tend to support limitless growth, i.e. they are still locked into the exploitation phase. We are truly at crossroads, this is either peak everything and the prelude to the next great extinction, or an inflection point; the “last battle” is taking place on the field of consciousness. I’m personally in the “I” camp, with elements of H & J; I believe it is essential to down-scale, and while I’d like to think that could be done peacefully, I’m not optimistic about the prospects. You left out the largest constituency: those that has no discernible view at all. They’re called consumers and they are focused on their careers, kids, retirement, sports or the latest thing-a-ma-bob. Who considers climate change or the imminent collapse of industrial systems? Less than 1 percent I’d imagine. 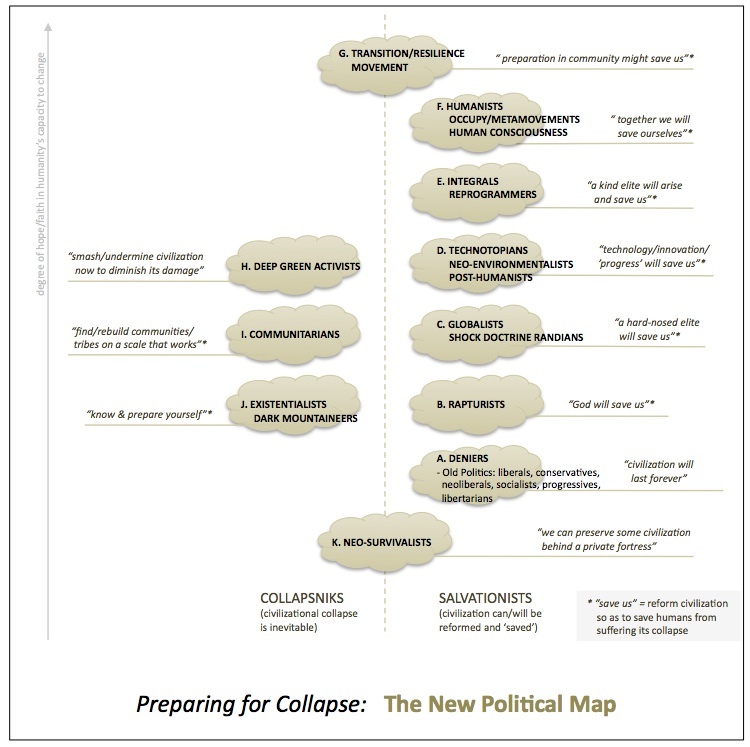 “Collapsatarians”, those who study these systems, are a sub-group at best and easily marginalized as the crazy fringe. I like your groupings though. I guess I’m in the Dark Mountaineer cult. Hi Dave, I found your blog a few weeks ago and have thoroughly enjoyed reeading through your stories and journey. I particularly enjoyed this post as I have tried to draw out a similar view (though not successfully) to rationalize the various diverging groups. I have for sometime now been in camp “J”; but I find that parts of me cannot abandon F,G,H, and I. These groups provide some hope and some positive impact on the lives of many and, therefore, i cannot abandon them either. Though as time moves on, I find that the lack of a conscious, ego-fee mindset in our societies pushes me to further accept that the massive system imbalances across so many vectors will not be resolved without a reset. So with that, J becomes my home and my appreciation and gratitude for those that continue a good fight of which I will continue to support. Thank you for sharing this! I’d agree with Mike Sosebee, most people – especially in the US – are in Camp Z. You could call this camp “Cupcake Land”, because people who belong to *any* of the other camps are looked upon as oddballs and freaks. The only acceptable topics for conversation in Cupcake Land are, for men, professional and high school/college sports (baseball, basketball, or football, depending on the season), and for women, real estate values and comparison of the monetary value of possessions. During elections, they will vote for whatever candidates are chosen for them by the dominant political party, either Republican or Democrat but no others, for their region. If you look at the last presidential election, you’ll see that about 97% of the US population is in Camp Z. Other than that, they have no political opinions other than a vague desire for the government to support their lifestyles while at the same time leaving them alone. Oh, and by the way, each and every one of them is absolutely addicted to TV and the hypnotic suggestions emanating therefrom. And, by the way, Camps L and Z fall into neither categories Collapseniks nor Salvationists; instead they fall into the category of “TL/DR” for Camp Z and the “1%” for Camp L.
used to be a rapturist, became a thinker not a believer which led to being an existentialist then a buddhist, then a sceptic. now, how to live kindly and carefully within all our wonderful species. i’m in the NTE camp – humanity has run its course and has done irreversible damage to the planet by going beyond the Earth’s carrying capacity, altering its chemistry through unabated toxic pollution, greenhouse gases and radiation, and being so ignorant that we ignored all the warning signs until it was far too late (meaning we’ve gone past several tipping points triggering positive feedback loops on our climate that will only continue to make it harder for any life to exist after a relatively short time – say 20 years or so if we’re lucky). First time at your site via Carolyn Baker. In the future I plan on spending more time at peaker sites rather than where I have been….Alex Jones. Curious to know where you think he would be. I do believe that a globalist cabal wants to herd us into reservations (and cull the population) while they live the high tech, high consumption lives themselves. Have you spent any time researching that perspective? Just read a biography of Genghis Khan (Rutherford) and came to the conclusion there will always be those who wish to dominate others. Fascinating read about a self-contained society becoming overwhelmed with development/growth. It is available in audio format. I was thinking that under our current system, the only way a steady-state ecologically based, culturally flourishing society could ever come into being is if some huge corporation like Exxon could somehow be in charge of the plan. But then, I realized it couldn’t work because profit making corporations must have endless growth or they would go out of business. So I concluded that a society run by profit making corporations and a steady-state ecologically based, culturally flourishing society and cannot exist on the same planet, it would be like mixing matter and antimatter. I am wrong to believe this is why we have the one type of society and not the other? When collapse comes, it will also be owned by corporations, and probably sold as a good thing, just like everything else they own. Obviously this line of thinking puts me in the missing M category with lots of sympathy for the H’s. WoW. No wonder you could not sleep! Wow, Dave. I found your blog by way of someone from the current place and time in my life. Yet know you! I assisted your first Heart of Now in Eugene a few years back and we discussed polyamory, among other things. I’ve bee shuffling through these collapse-preparation distinctions in my own life these days, having learned this year how dire is the planetary energy imbalance…our unfolding climate crisis. I am a member of DGR but not entirely aligned. I think DGR is too hopeful for me, ironically, though I gather you can relate. I am currently committed to raising awareness of climate change ( http://www.pacingtheplanet.org ), but I expect that within a year my energies will redirect into creating a viable framework for supporting the graceful shift out of existence for our species. I expect to co-create a support network and to promote an honoring social opinion of pre-meditated, civilized, voluntary self-extermination (I’m told that “euthanasia” is a knee-jerk offensive word to most people). This is my buddhist acceptance that our medium-term suffering will run quickly into death for most of us (collapse of our support systems..including a climate in which we can grow food and catch rainwater). 6. spend your remaining hours telling people how much you love them, and how sorry you are for wasting time worrying about the end of life whilst your real life ticks away.